Companies report tax payments, and companies make tax payments. Many times, those two things are not the same. As part of our ongoing look at how the corporate tax cut of 2017 has been affecting net income, we recently tried to quantify just how much those two things are not the same. Studying that gap across several years helps to understand how much corporate tax numbers were distorted in 2017 itself (more on that presently), and whether corporate tax payments today are dramatically different from what companies paid before 2017. We compared the difference in provision for income taxes (what a company plans to pay in taxes for a year) and income taxes paid (what the company actually did pay) for 400 firms in the S&P 500, 2014 through 2018. Then we expressed that difference as a ratio of actual taxes paid to the provision for income taxes. For four of the five years we studied, the median firm in our population actually paid anywhere from 75 to 85 percent of what it had made provisions to pay. See Figure 1, below. The exceptional year is 2017, where the ratio spiked to 98.4 percent. That is, almost all the taxes our median company prepared to pay, it actually did pay. Why? Because when Congress enacted the corporate tax cut in 2017, companies suddenly had to pay large one-time “deemed repatriation taxes” on unremitted foreign earnings; or had to revalue deferred tax assets and liabilities; or do both. And those one-time tax moves had huge effect on companies’ tax payments and tax rates. Calcbench wrote about this several times in the first half of 2018, as companies were reporting some sky-high effective tax rates in their 2017 annual reports. Our chart above is one aggregate glimpse of that effect. Table 1, below, shows the tax payments-vs.-provisions for our 400 firms collectively. You’ll notice the percentage ratio here is different from what we have in our chart above. That’s because of outliers at both the top (they paid much more than their provisions) and the bottom (they paid much less), tugging at the average numbers. That brings us to our final point for today: that individual companies have seen some large differences between tax provisions and taxes paid; and seen large changes in those numbers from one year to the next. For example, in 2017 Gilead Sciences ($GILD) had provision for income taxes at $8.88 billion, but paid only $3.34 billion — a ratio of 37.6 percent. In 2018, however, Gilead had a tax provision of $2.34 billion but paid $3.2 billion — a ratio of 136.7 percent (because Gilead paid more than it had in its provisions). We do this to amplify a point we made in our previous post about IBM ($IBM) — that drawing conclusions about how the corporate tax cut affects a firm is a complicated, company-specific exercise. You really need to delve into a company’s specific tax disclosures to get a sense of what is going on. Yes, some companies are experiencing a “tax cut sugar high,” where all their growth in net income for 2018 can be attributed to paying less in taxes, rather than from better operating income. 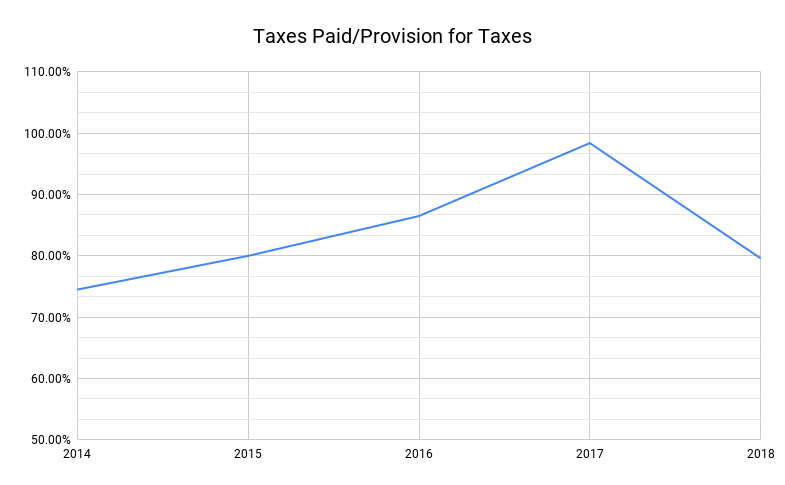 But some also paid so much in one-time taxes in 2017, that they were destined to pay less in 2018, and their tax payments now might be only marginally lower than what they paid in 2016 or prior. So is that a sugar high now, or was it sour lemons last year? You can use Calcbench to find the answer for whatever companies you follow, but it’s a question that needs thoughtful research to find the right answer.